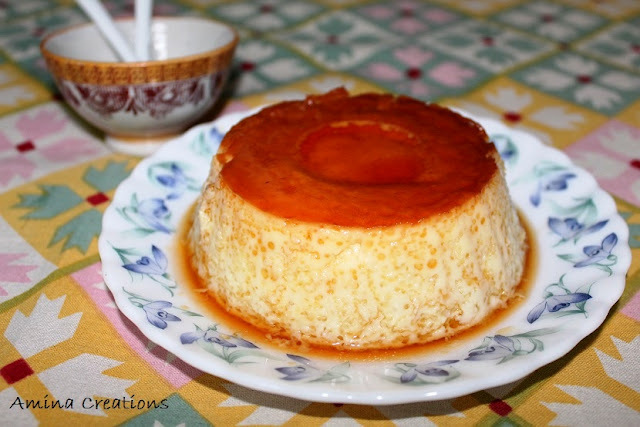 Caramel custard pudding or egg pudding is a very delicious and popular dessert around the world. The pudding is steamed hence there is no oil used. With just 3 ingredients that are available in every Indian home, this dessert can easily be prepared. I have already done a post on this but this is a more detailed recipe with step by step pics. Boil 3 cups of milk in a pan, then reduce the heat and cook till the milk reduces to half (i.e. 1 and 1/2 cups). Allow the milk to cool down completely. Take the egg yolks and whites in separate bowls and beat with an egg beater till fluffy. (The yolks will not be too fluffy). Add sugar and whites to the yolks and continue beating. Finally add milk and beat again. All ingredients must have been mixed well and the mixture should be completely covered with bubbles. Now for caramelizing the sugar, take a aluminium pudding bowl and add 1 tbsp sugar and a few drops of water, place it directly on the stove and heat. The sugar will start melting and changing colour. Heat till it gets a golden colour. Remove immediately from the stove and after a minute, add the egg-milk-sugar mix to it. Now take a steamer and place the pudding bowl at the centre. Close a lid over the bowl. Make sure that no moisture or water enters the pudding bowl. If necessary place some weight over the lid. Add water to the steamer such that it fills up to less than half the height of the pudding bowl. Then close the lid of the steamer (or idly cooker) and cook for about 20 minutes. After 2 to 3 minutes, open the lid, and check if the pudding is cooked. For this insert a knife, if nothing sticks to it on being removed, it is cooked. Otherwise, add some water to the steamer and steam for 10 more minutes. Once done allow it to cool, and then refrigerate it for at least 2 hours. For serving, pass a knife along the sides of the pudding bowl, place a plate on top and turn the bowl caramel side up. Cut it into slices and serve. You can also use a pressure cooker or an electric rice cooker to steam the pudding.The only addition is to place a perforated plate at the bottom of the cooker. The procedure and cooking time is the same. The pudding can also be cooked in an oven. Super tempting pudding !! looks YUM !! very delicious,will surely try out this recipe. Very yumm made Caramel Egg Pudding Dear.So deliciously explsined. Wow, looks really superb, awesome..
wow..what a gorgeous egg pudding dear...loved it ! wow..pudding looks so delicious n tempting...very well made dear...thanks for the detailed recipe!! I make caramel pudding like this all the time and everyone at home loves it! First time in your space..Happy to follow you! The pudding looks perfect Amina. First time at your blog space and I was thrilled to see my favourite dessert on your latest post :) Delicious post. Following your blog now. Very delicious and yummy pudding..I have left an award for you. Please collect it at my blog. One of my all time favourite desserts. In fact I made it just a couple of days ago for an iftar party. My recipe is slightly different as I use condensed milk and steam it in the oven instead of the stove. Thanks a lot for linking it to my Virtual Eid Potluck Party. Glad to follow you. thank you thank you i have always wanted to try an authentic recipe for this!